We love to eat red meat at home, whether it’s grilled, roasted or in soups such as sancochos, but we only do it about once a week for health reasons and it’s usually on the weekends when my husband likes to light up the grill for some carne asada. Carne asada is very popular in Latin America and in Colombia you will find tons of places that will sell it with salted potatoes and arepas, as well as kabobs (chuzos) and picadas, which is a medley of different kinds of fried meat served with other Colombian goodies. I’m pretty sure that many of you have had carne asada before, probably one of many Mexican versions that usually has all kinds of spices and hot peppers, or perhaps one of the many different Colombian versions that usually has cumin and beer as some of the ingredients. This recipe is not one of those of two and I came up with it by pure accident. I was trying to replicate the flavor of a mojo made by Goya that I used to buy years ago and the result is the recipe that I’m sharing with you today. I decided to post a Colombian version later this year when I make our famous chuzos and perhaps a Mexican version for some wonderful tacos. 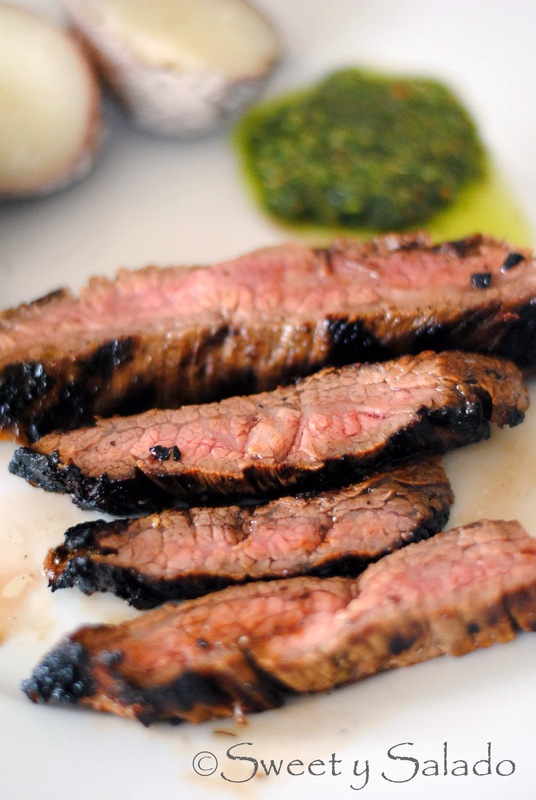 For this recipe I decided to use flank steak which is one of the most popular cuts of meat used for carne asada. In Colombia they usually grill it until it’s well done because they scream and run away in terror if they see any pink or blood in their meat. The bad part about that is that it doesn’t matter how long you marinate it for and what ingredients you use to tenderize it, flank steak will always come out hard and chewy if it’s overcooked, period. I usually grill mine until it’s between medium rear to medium but please feel free to grill it to your desired doneness, just don’t say I didn’t warn you! 1. Place all of the ingredients of the marinade in a food processor or blender and blend until smooth. 2. 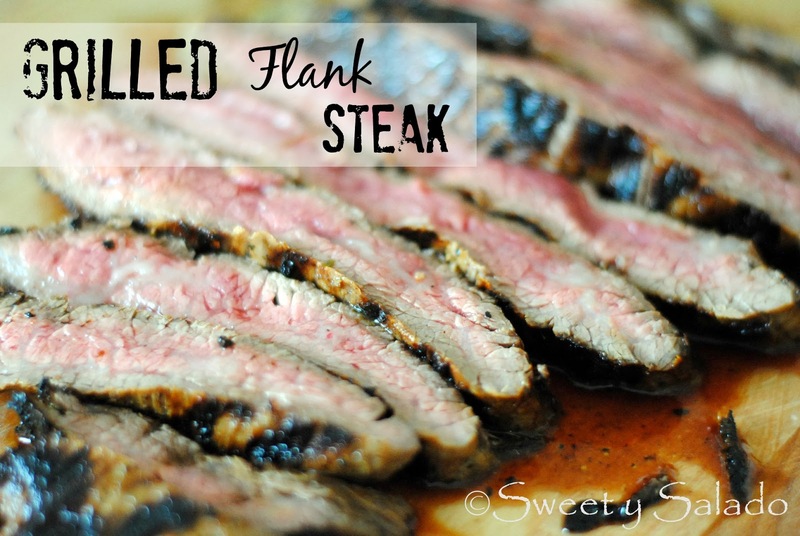 Rinse and trim any excess fat from the flank steak and place it in a resealable bag. Add the marinade and massage it to make sure it is well covered. Place it in the refrigerator for about 1-2 hours. 3. Heat a grill pan over medium high heat. Add a little bit of oil and grill meat for about 8-10 minutes per side or until medium rear to medium. 4. Place grilled meat over a cutting board and let it rest for about 5 minutes. Then, slice it into thin strips cutting against the grain and serve. You can serve it with salted potatoes, arepas, chimichurri, or Colombian green hot sauce.